Our number one goal at Take Care Chiropractic & Wellness is to take care of you. Our Minneapolis chiropractic center cares about your well-being and provides the highest quality of services to maintain and improve your health. Conveniently located in the skyway level of downtown Minneapolis, Take Care Chiropractic & Wellness invites residents, workers and commuters to visit our center and learn the benefits of our holistic approach to wellness. Our chiropractors in Minneapolis offers a drug-free approach to reducing back pain, neck pain, headaches, fibromyalgia, sciatica, migraines, allergies, asthma and spinal misalignments such as scoliosis. 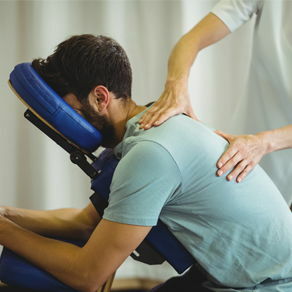 Our non-surgical and non-invasive techniques include gently spinal manipulations to position your back into a stable and healthy environment. From a healthy spine, flows a healthy body. Your circulation improves, inflammation decreases and healing begins. Although our main focus is on your spine, Dr. Michael Oste uses his 14 years of experience to adjust your joints and eliminate knee pain, hip pain, shoulder pain, carpal tunnel issues and foot discomforts. We combine our chiropractic care services with massage therapy in Minneapolis for a total-body experience that promotes healing. Massage therapy services reduce tight areas and help your body accept the chiropractic adjustments. Take Care Chiropractic & Wellness takes care of you by viewing your body and lifestyle as a whole. We provide lifestyle guidance, nutritional counseling, teach corrective exercises and offer health classes to bring you the most current information on living a quality life. We help you recover from an auto accident injury that may include whiplash, back pain or neck pain. If you have suffered a personal injury such as a slip and fall and have injured your back or tail bone, Dr. Oste reduces your pain and helps to speed the healing process. We also welcome you to our center if you are dealing with a work-related injury. We help you return to work quickly and get back on your feet. From your initial consultation, we evaluate your health and your spine to determine the best chiropractic care program for your needs. Dr. Oste may also ask to view x-rays of your spine for a better understanding of your discomfort. As your care progresses, we monitor the improvements and adjust your care as needed. Chiropractic care in Minneapolis is gentle and comfortable. Dr. Oste uses the right amount of touch to ease your vertebrae into alignment and support your healing. You feel the difference after your first visit. Your pain is reduced and your range of motion is improved. Our goal is to see you as often as needed at first and then on a maintenance basis to support your progress. Chiropractic care is a wonderful injury-preventive if you are physically active. We also care for your children as they begin their athletic pursuits and transition with a growing and changing body. Fill out form or call us at 612-746-5555 to hear about our current offer. Make a healthy choice every day! Organo Gold coffee and tea contains 100% Organic Ganoderma Extract (also known as the reishi mushroom), one of the world’s most researched and beneficial herbs. It's the perfect way to make your coffee and green tea even healthier! Dr. Michael Oste is the clinic director and licensed Chiropractor serving the Minneapolis community for the past 14 years. He is a graduate of Northwestern College of Chiropractic in Bloomington, MN. He received his B.S. degree in biology from the University of Manitoba. As the founder of Take Care Chiropractic & Wellness. Cecilee earned her Bachelors Degree in Science and Design Communications from the University of Minnesota. Cecilee is passionate about the wellness lifestyle and makes it her mission to research safe and natural alternatives to conventional medicines. She is a certified natural childbirth instructor and Bradley Method trained. Cecilee enjoys gardening, boating, outdoor activities like skiing and being with her children and family. Amanda is a certified Chiropractic Technician from Moraine Park College in West Bend, WI. She has had a passion for natural healthcare since a young age after her first visit to a chiropractor, after which she decided to become a certified Chiropractic Technician. She also went on to get her bachelors Degree in Healthcare Management. She grew up in south-eastern Wisconsin and met her husband in St. Paul, MN. Together they enjoy spending time with family, friends and their two dogs. Kelsey graduated from CenterPoint Massage & Shiatsu School in April of 2015 with a certificate in the Therapeutic Massage Program. Kelsey is trained in Trigger Point Therapy, Therapeutic Deep Tissue, Traditional Swedish Massage, Cranial Sacral Therapy, Lymphatic Drainage, Thai Massage, Internal Jaw and Prenatal Massage. Kelsey enjoys working on challenging body conditions, recovering past and present injuries as well as helping clients relax while educating them on self-care to feel their best. In her free time, Kelsey likes to spend time with her friends, family & dog, Oliver. Mandy graduated from National American University in 2017 as a Massage therapist. Mandy is trained in Trigger Point Therapy, Therapeutic Deep Tissue, Traditional Swedish Massage, and Prenatal Massage. Mandy is an outgoing and passionate massage therapist that is equipped with the precise knowledge on what is needed to execute a successful massage. "Adjustments. Massage. Nutrition. Knowledgeable doctor. Skilled staff. Friendly peaceful environment. The healthy place to be in the skyway. Best way to support mental and physical well-being during the 40hr work week."